Stir until smooth. Stir in the extract and the marshmallows. Pour into a well-greased pan. (I used an 8x10 pan, however any size will work.) 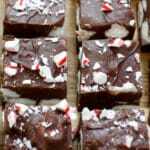 Top with crushed candy canes. Chill until ready to serve. Store in an airtight container in the refrigerator for up to a week. Enjoy! * Measure peppermint extract very carefully. I never measure over the bowl! If you add even a few drops too much, the flavor will change from "mint" to "toothpaste." This fudge will keep nicely in the refrigerator for up to two weeks. Store in an airtight container, separating multiple layers with parchment or wax paper. Serve from the refrigerator.